It was a tough weekend keeping Ken on the sofa ... making sure he was fed, he had his pain medications, the television remote was always within his reach ... just brutal! Actually, the hardest part was convincing Ken to let me do all those things for him and to keep his feet off the floor. Keeping Ken still in the house when it was such a nice weekend wasn't easy. I had to do a little real estate work Saturday morning then buy a few groceries, leaving Ken alone for a while. I was happy to see that he was still on the sofa when I got back home. Shortly after I came home from my errands on Saturday, I heard something at our front door. 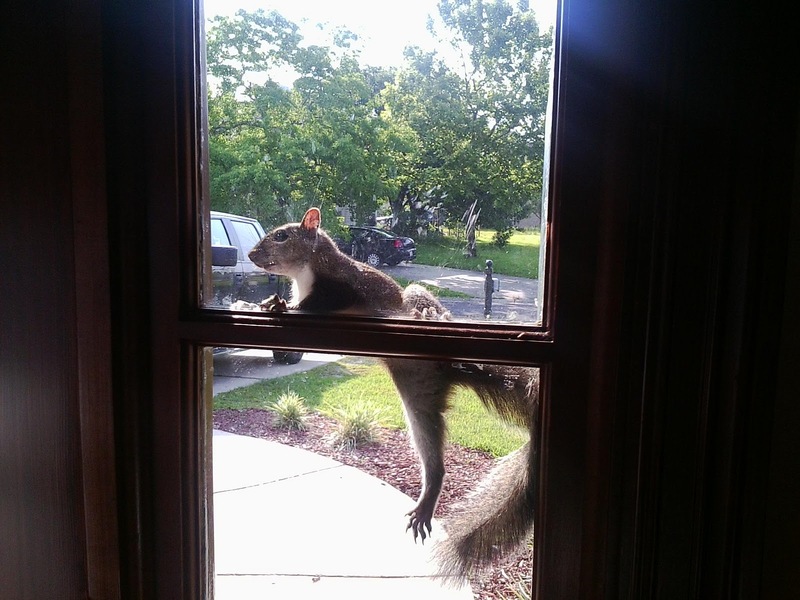 When I peeked into the foyer, I found a squirrel ... sitting ON our front door! Evidently, Ken has been having visitors when I'm gone. Well, if the squirrel keeps him from going nuts than I guess it's all good. After a weekend of terrible television and too much ice cream, I think Ken's gonna survive his recent injuries. It's been almost two weeks and his wrists and the right side of his torso are still real sore, but after doing more research I don't think he's got any internal bleeding since he doesn't have any bruising or discoloration. Yesterday I finished a painting job that he had going on, and he just supervised me and another guy. Today he was going to supervise a small concrete job, so he hasn't been pushing himself as much as he did last week. I don't wanna jinx ourselves, but I think we're going to be able to avoid huge hospital bills and a lot of lost work ... whew! Just about a month ago some salesmen from Aflac had spoken to our office, trying to sell insurance to us self-employed folks for those times when we get injured and can't make a living ... I had regretted not looking into that a little further these past two weeks. Like the Aflac duck on television (have you seen the recent commercials? ), Ken could have been getting paid while recovering from his injuries. Our budget is really tight until our house sells, but after this little incident I'm going to look into this insurance. Maybe we can afford it until our house sells and Ken can quit working so much. Maybe we can't afford not to have this kind of insurance .. hmmm. Last weekend, we had this rainbow sitting outside our front door. Maybe it's a sign of good things in our near future! So glad to hear things are going to be alright. You'll get back on track soon. 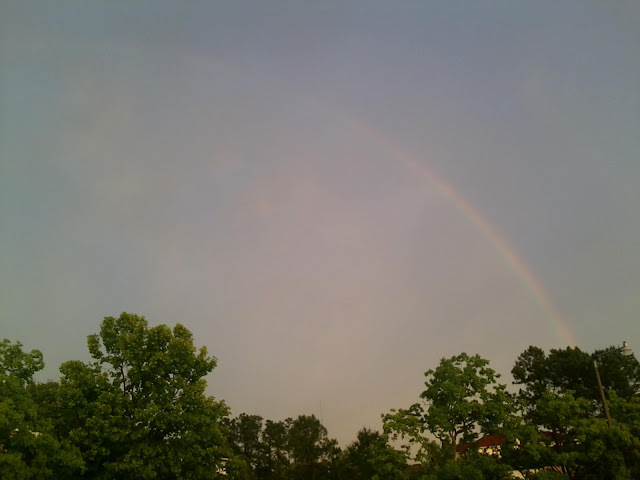 I'm a huge believer in omens and I think that rainbow is your sign. Just make sure he takes it easy for long enough that he gets truly well before jumping back into things. See you out there! At least Ken is doing better. Slowly but better. Poor guy. Nothing worse than not being able to do that things you want to do. Glad he's feeling better! Resting is sometimes the most difficult thing to do...lol. My wife used to sell Aflac insurance. It's actually a very good product, and they've been around for like fifty years! Probably is something to consider given you're self-employed. Hope his healing continues well...take care. I'm glad he is taking it easy. I'm always amazed that when people just allow their bodies to do the work of healing, a lot of expense can be avoided. I'm glad it is turning out that way for him. Since I'm self employed, I should look into that insurance, too. Cheryl - just getting caught up on your latest - bummer. Hope Ken's recovery stays on track.